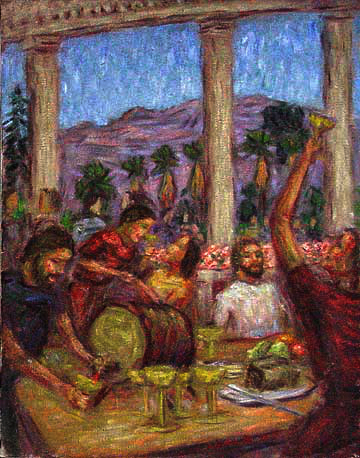 :"...it's Cana of Galilee, the first miracle.... Ah, that miracle! Ah, that sweet miracle! It was not men's grief, but their joy Christ visited, He worked His first miracle to help men's gladness.... 'He who loves men loves their gladness, too'... He was always repeating that, it was one of his leading ideas... 'There's no living without joy,' Mitya says.... Yes, Mitya.... 'Everything that is true and good is always full of forgiveness,' he used to say that, too"... "Jesus saith unto her, Woman, what has it to do with thee or me? Mine hour not yet come. "His mother saith unto the servants, Whatsoever he saith unto you, do it". . . "Do it.... Gladness, the gladness of some poor, very poor, people.... Of course they were poor, since they hadn't wine enough even at a wedding.... The historians write that, in those days, the people living about the Lake of Gennesaret were the poorest that can possibly be imagined... and another great heart, that other great being, His Mother, knew that He had come not only to make His great terrible sacrifice. She knew that His heart was open even to the simple, artless merrymaking of some obscure and unlearned people, who had warmly bidden Him to their poor wedding. 'Mine hour is not yet come,' He said, with a soft smile (He must have smiled gently to her). And, indeed, was it to make wine abundant at poor weddings He had come down to earth? And yet He went and did as she asked Him.... "